This blog is currently under the control of Adam’s Canadian girlfriend, Shannancy. Muahahaha! As this is being written, I am sitting in Sea-Tac international airport, waiting to catch my 6:00 am flight to LA. I am dictating this blog, via cell phone, to my lovely Shannancy, the totally awesome and magical and super super amazing person you should totally subscribe to, who has been kind enough to stay up and chat with me so I don’t go insane sitting around a not-quite-empty airport that is filling up as I speak. I actually love airports… They’re jumping off points to new adventures. At approximately 8:41 this morning I will arrive in LA and will shortly thereafter be picked up by Amber (AKA TheAmberyOne) and Karissa (AKA Imgonnabeatree). Throughout the rest of the day more and more of the Classy Ladies — the strange people I call friends — will arrive, using assorted means of transportation. It will be the first time we have all seen each other since the 2009 North West YouTube Gathering. Damn them. Damn them for getting to see you when I’m stuck here! STUPID CANADA, BE CLOSER TO CALIFORNIA! VidCon is one of the few events in existence to use the dual meaning of the word ‘Con’. The word ‘Con’, in this context, can mean either ‘conference’ or ‘convention’. That is a surprisingly fun sentence to read aloud. Try it! I DARE YOU. Conferences are generally seen as a group of professionals getting together, trading notes, attending workshops and learning more about their craft. A convention is more often something like a comic convention, with booths, celebrities and fangirl-y geeks. Vidcon, however, serves as both a learning and networking opportunity for video professionals, as well as a gathering for Youtubers who simply want to spend time with one another and meet their favorite YouTube stars. I wanna learn and network and gather. Dear Santa, please send me to VidCon! There‘s no parking in the red zone… Adam is currently pissed off at the airport announcements. 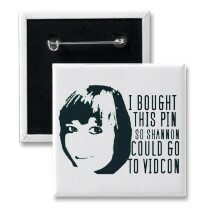 Personally, I am attending VidCon for both reasons. In addition to wanting to see all my favorite Youtubers, and my friends, the Classy Ladies, I will also be treating it as a professional conference, and, as such, have prepared a large number of business cards to pass out. My hope is that I’ll meet a few interesting people willing to collaborate on new projects, and perhaps gain a few new supporters as well. My hope is that I’ll get totally famous by dating Adam. Heck, if I get can a paying gig out of it, even better! Please give my boyfriend money so he can eat. Also in attendance will be Jeff Klein of Norman Tweeter Productions. Amazingly, Jeff managed to snag a ticket to VidCon after the event was sold out, which just goes to show what perseverance, not to mention Hank Green’s email address, can get you. Jeff and I will no doubt be making many crazy puppet videos at VidCon, including ones featuring a brand-new AdamTheAlien puppet. At this point I don’t know if I’m more jealous of Jeff or Adam; they’re both ridiculously fun to collaborate with. Anyone who was following my videos back in March, around the time of the Emerald City ComiCon, (Aside from my car asploding, that was a fantastic trip.) may remember the first AdamTheAlien puppet. This version was incomplete, and still had a lot of modifications to go before it was finished. It had foam hands that I may have broken several times. Ultimately, the number of changes that needed to be made necessitated the creation of a brand new puppet. I am ecstatic to say that the new puppet looks exactly like the chalk drawings — right down to a tiny fedora. It doesn’t have an awesome beard though. Silly beardless alien. It should be noted that at the time this is being written, I still have not released all of the 2009 North West YouTube Gathering videos. Not to mention the 2009 Americhordal Gathering. Given that, and the fact that I am currently working on videos that will pay my bills, I cannot say with any assurance when my VidCon videos will be up. I can say, however, that I will get them up as soon as I can. Sometime after VidCon 2012? In the meantime, as the event is going on and afterward, simply search ‘VidCon’ on YouTube. Or click the link I just gave you. I’m sure there will be no shortage of videos. Including one of me just crying. At this point in the dictation, the sun is rising over the airport, meaning that my boarding time is nearing. The sun is almost completely up here, it’s a little bit ridiculous. Before I sign off, I wish to issue a challenge to my readers: in the comments below, please write suggestions, ideas and challenges for videos I should make at VidCon. If you tell him to shave his face, or kiss someone, or anything else that I deem bad, I will kill you with my mind. If your idea is chosen, you will be credited in the correlating video. I’m changing whole sentences from sleepy grammar to correct english… Sleepy Adam is adorable. At this point, it is time for this sleep-deprived and airport-addled Alien to say mushy things to his girlfriend, urinate, brush his teeth and board his plane. Watch this site, Twitter, my YouTube channel, and the Vlogtag channel for VidCon antics as they happen. Until then, fare thee well, and may your day be more entertaining than this airport. AIRPORTS. ARE. AWESOME. Plus you were talking to me for over two hours. Quitchyerbitchin, VidCon attendee. I must say, it was a joy to help Adam write this, and fill it with my own thoughts. If you enjoyed my thoughts, you can go read more of them at my blog, which has recently been emptied of writings, but will be filled up again soon. My guess is that your going to have dozens of Toobers say ‘hello, Vlogtag…’. Do a bunch of quick edits of highlights and set it to electronica. Also, get someone to tape the scope of the con, then slowly zoom in on you. Ooh. Use your camera to record the audio of you intro’ing and describing the con. Yeah. That’s all I got after a long… LONG day of drill.